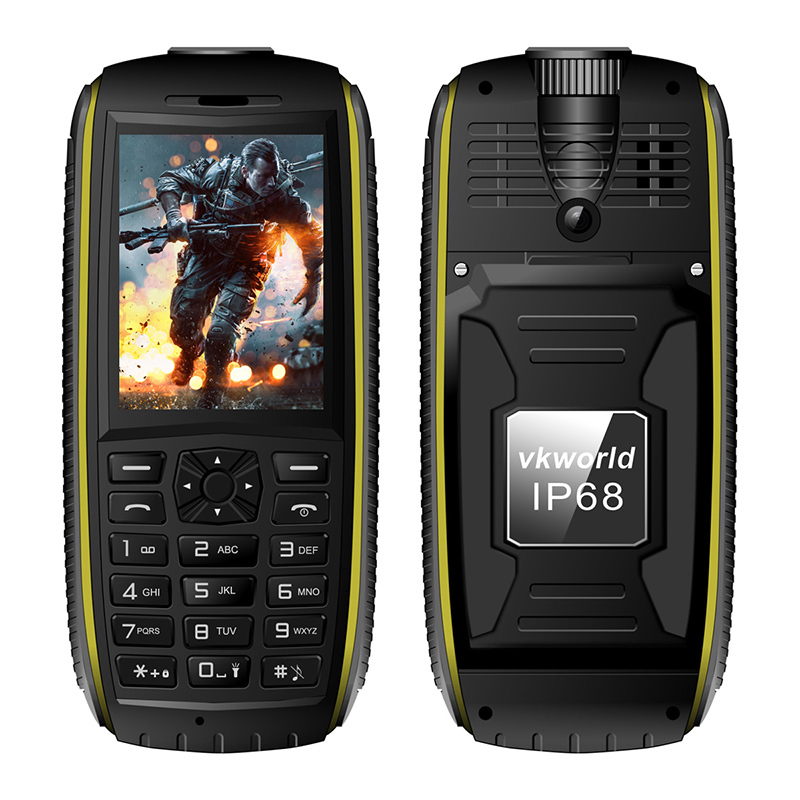 Successfully Added VK World Stone V3 Max Rugged Phone - 2.4-Inch Display, 5300mAh, Flashlight, IP68, Waterproof, Dual-IMEI, 1.3MP Cam (Yellow) to your Shopping Cart. The VK World Stone V3 Max is the perfect rugged phone for all outdoor enthusiasts out there that simply are looking for a device that keeps them connected to their loved ones back home without needing any other Android or iOS features. Thanks to its fully rugged IP68 design, this waterproof phone is resistant to water, dust, drops, and even low temperature. No matter where on the globe you’re located, the VK World Stone V3 Max is an extremely tough cell phone that will follow you wherever you go. From the icy North of Scandinavia to the humid rainforest in South America – there is nothing that this rugged phone can not handle. This Dual-SIM cell phone features two IMEI numbers through which it allows you to be reachable on two phone numbers simultaneously. From now on you’ll be able to throw in a local SIM card while traveling abroad to enjoy local charges while, at the same time, staying reachable on your old and trusted domestic phone number for the people back home. Additionally, Dual-IMEI cell phones offer great efficiency to those who wish to separate their work and private life while only using one telephone. Packing an epic 5300mah battery, the VK World Stone V3 Max is an extremely powerful rugged phone that provides you with a stunning 72 hours of usage time. Added to that its massive battery is capable of staying alive at standby mode for a mind blowing 15 days – allowing you to head out into the wild with confidence as this waterproof phone guarantees that you’ll always stay connected to your loved ones back home. No matter where your upcoming adventure will take you, with this powerful Dual-SIM cell phone you will always stay connected without ever needing to worry about running out of juice. Featuring a built-in 1.3MP camera, this rugged phone lets you snap nice pictures. The next time you’re out in nature and enjoy a stunning view or beautiful wildlife activity the VK World Stone V3 Max lets you capture these unforgettable moments in beautiful quality – allowing you to share and recall all those special memories on your 2.4-Inch display once back at home. Its intergraded and extra-bright flashlight furthermore assures that you’ll stay safe after dark. By supporting 8GB of external memory you can be assured that there is always enough storage to keep every picture you snapped during your previous trips and adventures.